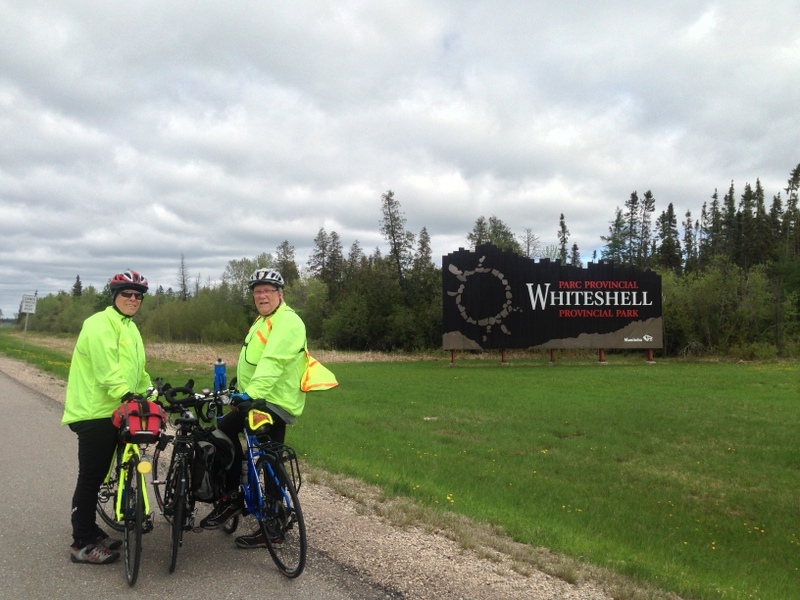 <- Read previous post: Now Touring Manitoba: The Soggy Bottom Gang! 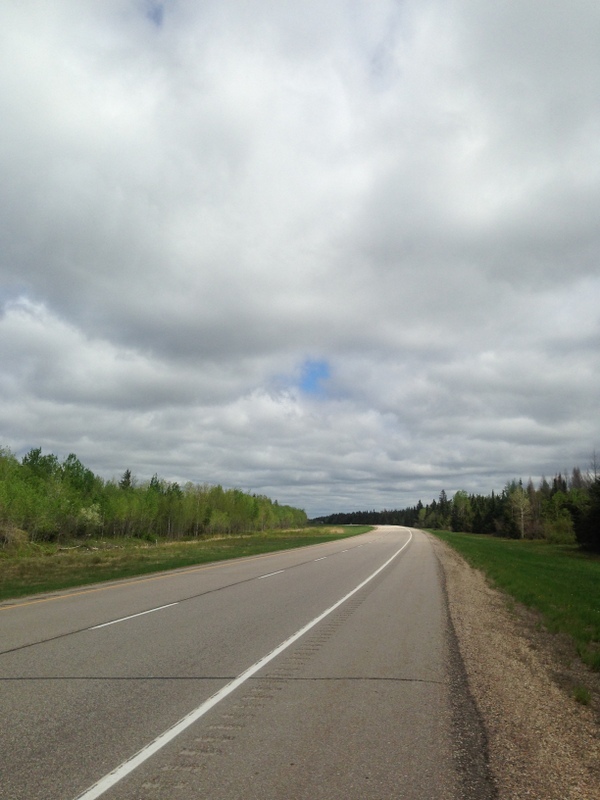 There isn’t much to tell about our ride towards Portage la Prairie. All I can comment on is that there was a continuation of lovely birds, marshes and really loud frogs, there were still really bad shoulders at times, and we still had wind. The nicest part of the day is that it didn’t rain. Well, it did mist, but not to the extent where you have to don full gear from head to toe. We are still shocked that a major Canadian highway can still have gravel shoulders for kilometers at a time. That caused us to abandon the TransCanada, hop into the RV just west of Portage, and drive to Creekside Campground 13 kms east of town. It was either that or become hood ornaments. With all the dampness the last few days, most of our cycling gear was either damp or absolutely wet. And if you want to start your day out on a low note, try climbing into cold, wet clothes that smell unpleasant (and I’m being kind with that description), and know you have to be in them, sweating some more, for the next 8 hours. So after nice warm showers, which can be the highlight of our days sometimes, we headed back to Portage to do loads of laundry. 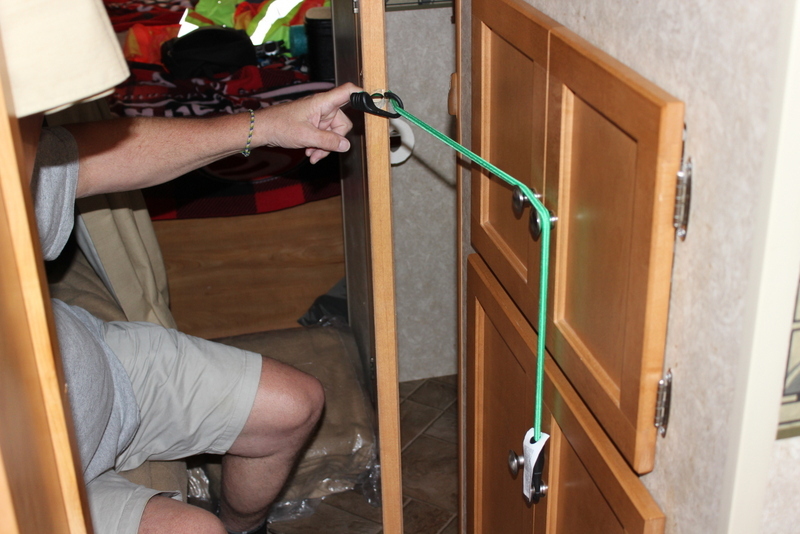 We also had to pick up a new door knob for the bathroom in the RV, as the old one kept locking up and couldn’t be repaired by our “handymen”. The last thing we want on the road when you are desperate for the biffy is to have it locked. The boys can discreetly do their business elsewhere if necessary, but I choose not to bare all by the side of the highway. Have I mentioned how few trees there are by the side of the road? Anyway, they did get the new one installed with only a bit of discussion back and forth, and some minor hemming and hawing. 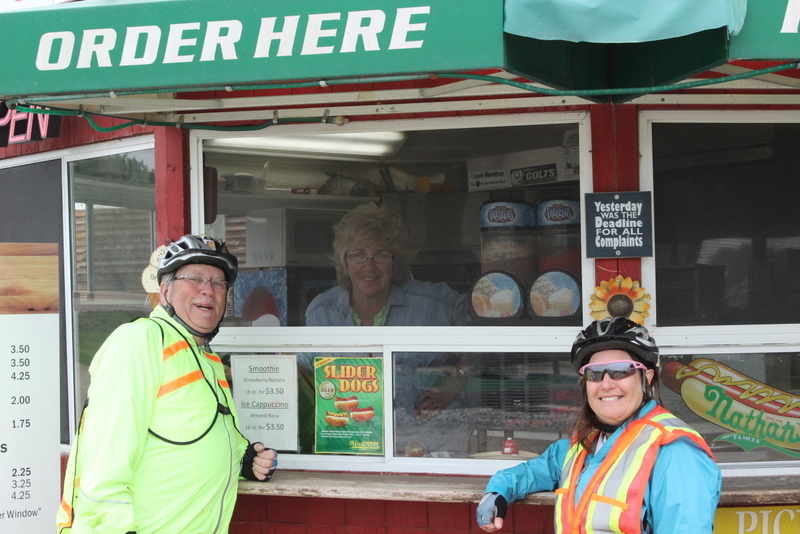 We went to a very inexpensive buffet for dinner, and met two other cross-Canada cyclists from Naniamo, Bob and Brian. These two are doing the trip self-support, and they are not young whipper-snappers, much like us. Bob had been sick for the last few days, and we felt really sorry for him as he had missed several days of cycling and had to catch rides hitch-hiking or with friendly B&B operators to catch up with Brian. 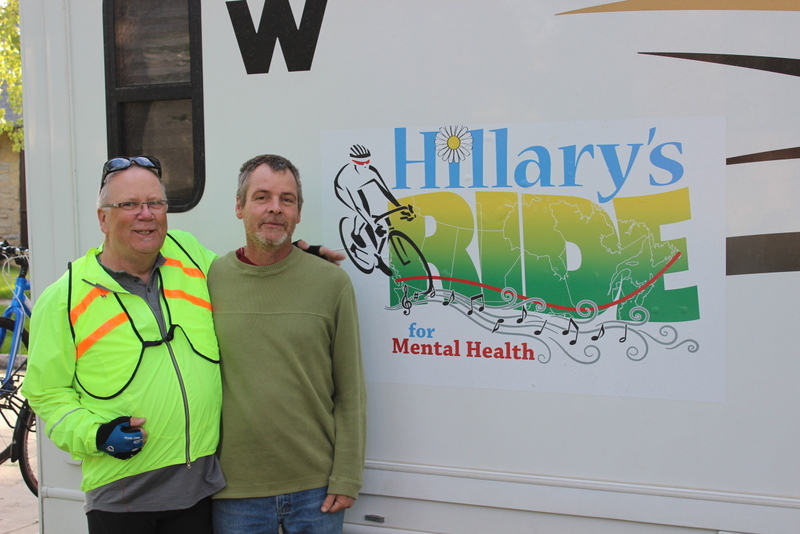 They are both cycling for different causes – Bob for Alzheimer’s care (Nanaimo Travellers Lodge) in honour of a close friend, and Brian for the Children’s Miracle Network, which is strongly supported by Re/Max where he works. We had a great discussion about the trials and tribulations of prairie cycling with the weather conditions we had – it’s good to talk to others who’ve been there, done that. And we felt really thankful that we got to climb into our luxurious RV that night rather than a tick-invaded tent. Same weather – rainy, wet, crazy Northeast wind at 40 km/hr. We got an early start this morning, hoping to make up some extra miles after Winnipeg, to shorten our upcoming trek to Falcon Lake/West Hawk Lake. It started out challenging, but working as a team we managed to knock off about 55 kms. But that is where it went a bit wonky. The guys decided that rather than continue east to Winnipeg, we would drive north of the Peg to go with the wind instead of against it. In the process, we learned a few things. Lesson 1 – Don’t rely on Google maps, as there is no way to tell what kind of roads you’ll get if there isn’t a camera. Lesson 2 – bike trails aren’t necessarily for road bikes. Lesson 3 – if the Trans Canada has no shoulders, don’t expect rural roads to be paved. Once I heard the guys making their plans, I decided to bail and spend the afternoon with Al in the RV instead as I was already cold and wet, and I can guarantee you I was really happy I made that call. As I was not out there, I won’t comment further than that, however, you may want to check out Spot to see the not so direct route that was taken. And the boys had to hose themselves and the bikes down before getting in the RV – gravel roads in the rain can be very messy. We eventually made our way into Winnipeg to stay with Uncle Phil, an old neighbor of Bill’s. When we first arrived, Bill went to greet Phil, who was just coming out of the house. We all thought this must be Phil’s son, because he was so young (or at least young like us). But alas, Uncle Phil is not an uncle at all – it’s an interesting story, but you would have to ask Bill about that. And Patrick sent me a care package that was waiting for me there – Tamari almonds to last me til the end of the trip. He is sooooo sweet – that’s why I married him! We had dinner out at Boston Pizza again, and again the wonderful manager (in this case Nathan), gave us a discount on our meal. We always ask, to keep expenses down as much as possible. After dinner, it was pretty much bedtime, which comes early for our geriatric biking crowd. I woke up early today, about 6:00 am, and it was raining pretty hard. So I thought, I’ll go back to bed until it stops. I woke up a dozen times, and the rain just continued. So I finally dragged myself out of bed by 10:00 am. No early plans today, so no harm done. In fact, the cabana boys made me breakfast to order, as they had all eaten earlier – bacon, eggs “facing the sun”, toast and Ethel’s famous jam. Delish! There are other advantages to sleeping in, including having your laundry done (thanks Terry!). Bill and Phil made a trip to MEC for Bill to pick up some merino wool articles, as he discovered it keeps him warm whether it is wet or dry, and he can wear it several days in a row and it doesn’t smell – bonus for all of us! The only downside is you have to take a second mortgage out on the house to be able to afford it, even when it’s on sale. 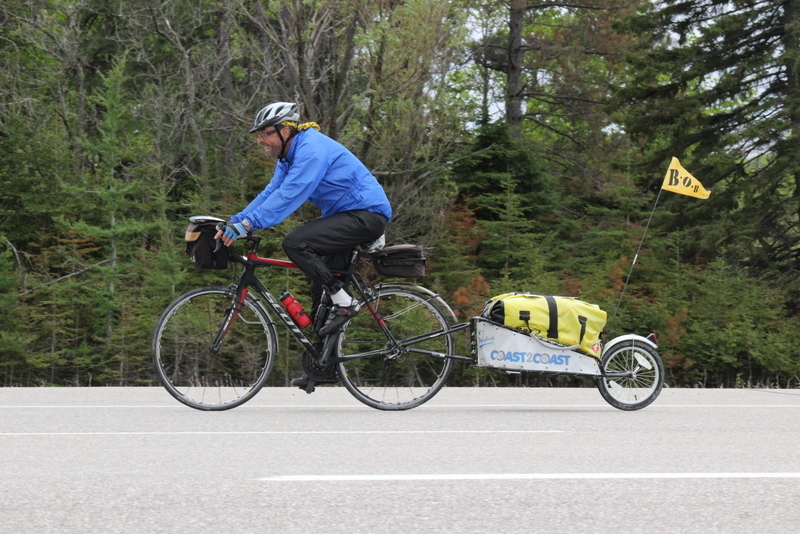 He also saw Brian cycling, one of the gentlemen we met in Portage a couple of days ago. 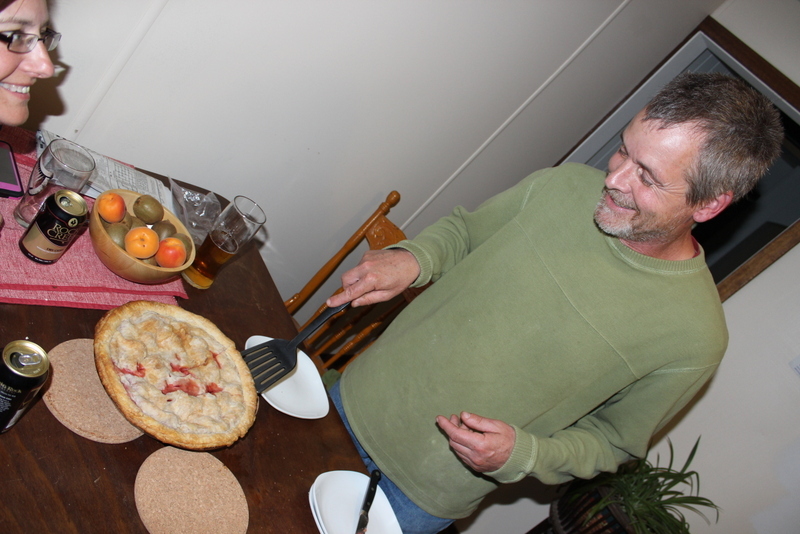 For the afternoon, Al and Terry hung out with Phil as he made us strawberry-rhubarb pie (rhubarb was “borrowed” from his neighbor), including the pastry. I accompanied Bill to an open house at Marianne’s, who worked as a teacher with Katie, Bill’s daughter, years ago. She invited over several moms and their kids from the neighborhood. We didn’t get the turnout we would have hoped for, as the rain and naps kept other attendees at home. We did have a good conversation about the ride and depression with the moms who came, and less attendees meant more fresh-baked cookies for us!! 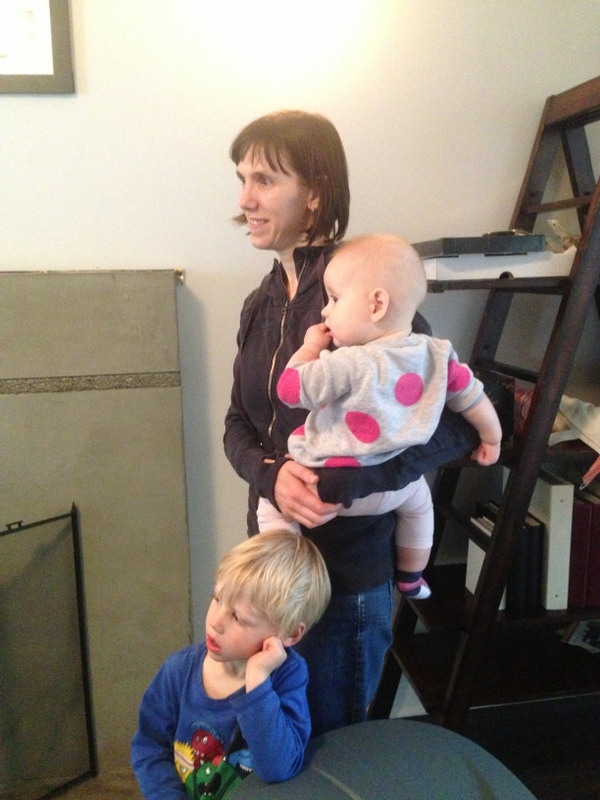 Bill sang “Puff the Magic Dragon” for Benjamin and Isabelle, Marianne’s little ones. 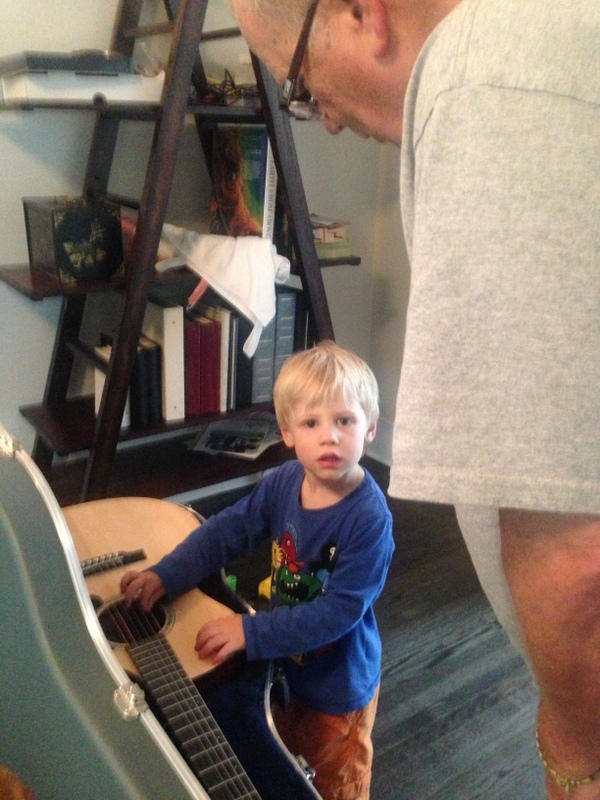 Benjamin thought it was pretty cool that Bill was playing his dad’s guitar, and so did Bill considering it was a really nice Martin. 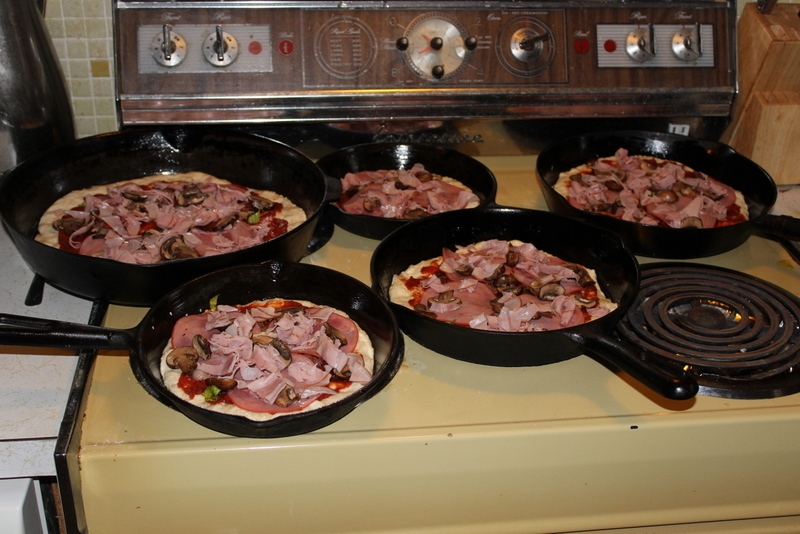 When we arrived home, we were treated to home-made pizza’s by Phil and friend Rachel. They had the best crust I have had for a very long time. Phil kept us in stitches the whole weekend. He has a deprecating sense of humour, but he picks on everyone equally, so he can get away with comments no one else could. And it doesn’t hurt that he is a really sweet guy, though he would never admit he is a softy at heart, despite his threats to skewer all the squirrels in his yard and eat them for dinner. He completely denies that he left a ceramic gnome in Bill and Betty jo’s car when he moved, but Betty jo sent photo evidence, which Phil is saying proves nothing. Anyway, the group of us had a great after dinner conversation, Rachel shared her experiences as an archeologist, and we again had a pretty early night. 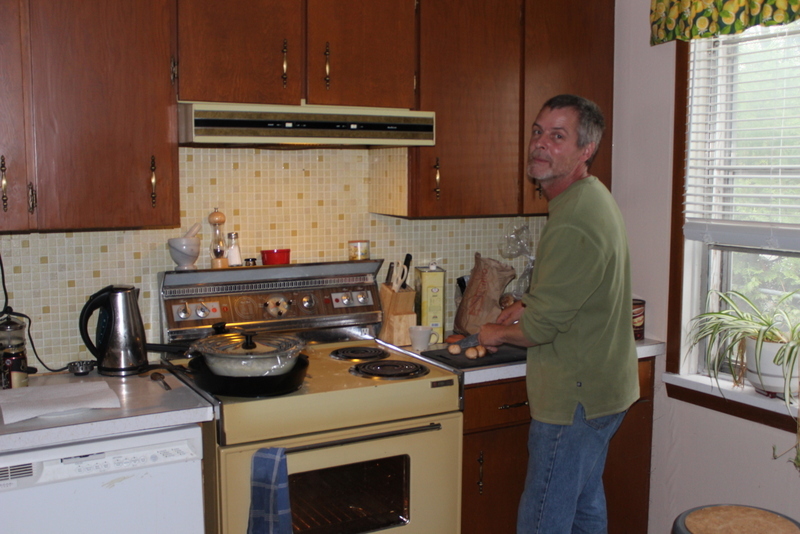 If you ever want to stay at a great B&B, give Phil a call – just don’t tell him we sent you. I was so excited, we awoke to SUNSHINE this morning!! It is amazing what a little sun can do for the spririt. It was still chilly and windy, but we will gladly take what we can get. After farewells with Phil, we headed east out of Winnipeg to check out the roads. We ended up taking the Trans Canada again, which had acceptable-width shoulders, and because it was twinned the weekend traffic of boats and trailers could give us lots of room by moving to the far lane. As soon as we got on our bikes, there was no sun to be had, we were completely socked in. Oh well, we know sunshine still exists somewhere above the clouds, and we have to see it sometime. And the wind is a crosswind today, so that is a relief. We stopped for a rest at Sandy’s Darn Good Food for a look at her menu. You could get the Adirondack burger special for $249.00 (it includes the chair). 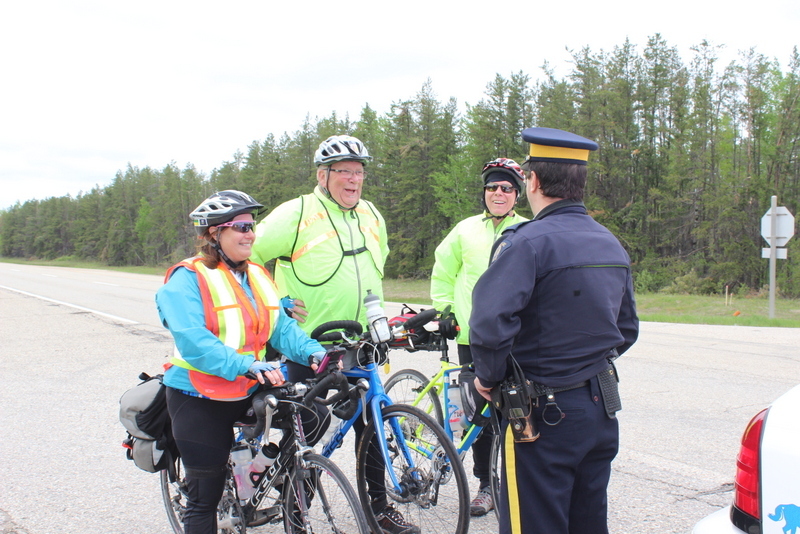 Shortly after our stop, Al was spotted with the RCMP on the side of the road. We thought maybe he had dined and dashed after getting his milkshake, but the officer was just wishing us well. We stopped for lunch at Prawda, as we needed some hot chocolate to warm our fingers and toes. You get a bit of a psychological boost when you can take a slightly later lunch, late enough to pass the half way point as far as distance goes, so that’s what we try to do. We gave out a few book marks, chatted with a few weekend vacationers, and got a couple of donations. After lunch, there was actually some sunny breaks for about 4 seconds at a time. Each one was greeted by a “whoop” from me, or at least a chorus of “Halleluiah”. I know that sun is trying to show its’ face. The landscape is starting to change to lots of trees and lots of rock. Some of us discussed earlier how we learn about the Canadian Shield in junior high social studies, but I have never seen it with my own eyes. So I’m pretty excited for the coming days and weeks. We’ll be in Ontario tomorrow, and for most of June. 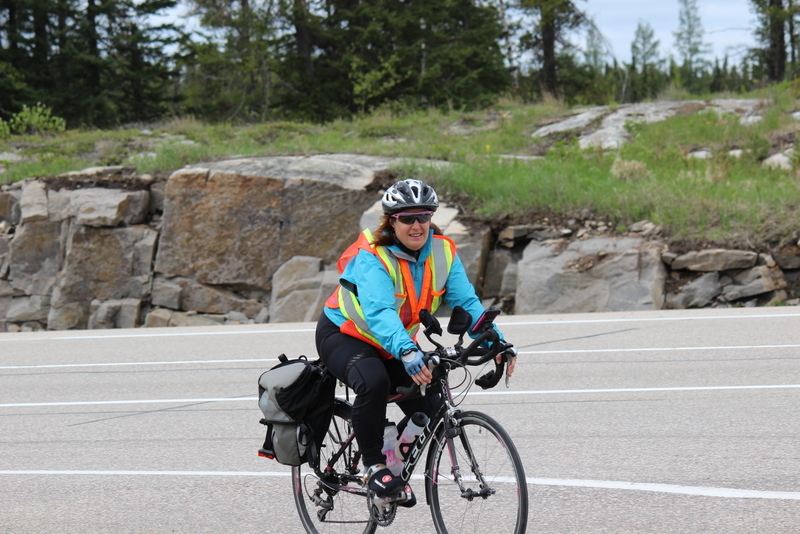 It felt like a quick 100 kms today, and we are camping at Falcon Lake in Whiteshell Provincial Park. The name comes from the stones that the aboriginal peoples in the area placed into animal designs like turtles and snakes, which can only be seen from the air. Very interesting, I wish we had time to see more and take in the interpretive talks, but the road is always calling us. I guess it has to go on the list of places to return to – and that list is getting pretty long. There was a bit of a mix-up with the campsite, which they thought was booked for yesterday. But after a few phone calls and a visit from someone in the main office, we managed to get our spot, and rewarded the staff with a ju-jube – hey, we’re on a budget! The evening cleared up, blue sky appeared, and we went for a peaceful walk along the lake. I bet this place is jam-packed in the summer, it is beautifully developed. But right now it’s pretty quiet. I hope we find more places like this to visit as we venture into lake country. Bye bye gravel shoulders! Enjoy ‘The Shield’ ……nothing but trees and rock! Hopefully you will see a moose or bear along the hwy. Love the photo of blue sky amongst the cloud..Your hearts and mind are in the right place. Keep your spirits up!!! Jane & I were talking yesterday how we sure love your blogs. You’re a great writer. Still trying to keep it upbeat too – I love your sense of humour with your choice of naming the photo “Hope”. Had to smile. 🙂 Kudo’s to Bill, Terry & Al for all the support too – both physically & mentally. Keep on trekkin’ – we’re with you in spirit. Bravo Sue for digging deep & finding the energy to craft these fabulous blogs. You are a tremendous writer and it sure helps me to appreciate how tough this ride is for all of you. I have some very scary memories of gravel, skinny tires & combined with the rain it makes me shudder. Be safe. Continue being smart & know you are all making a difference. Kudos! What a wonderful thing you are doing, I’m really proud of you! I am enjoying your travel logs Sue. You will come to appreciate your writings increasingly with the passing of time. You are in my thoughts and prayers. Proud of you. I love this……”We stopped for a rest at Sandy’s Darn Good Food for a look at her menu. 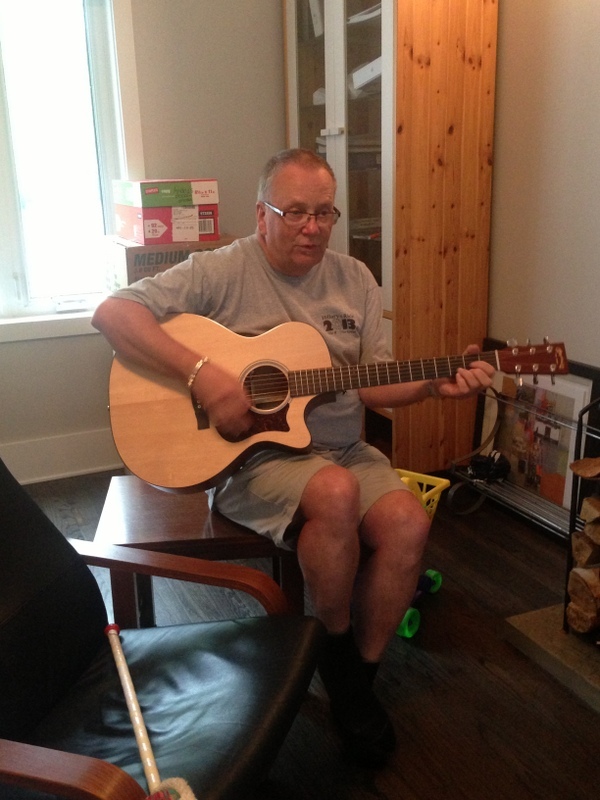 You could get the Adirondack burger special for $249.00 (it includes the chair)” …… I’m loving your blog! I’m keeping a file on all the cool places you are coming across. Sending waves (you probably don’t want to hear that word after all the rain you’ve been through!) …..anyhow sending waves of strength and good wishes for your journey! You are doing a fantastic job for a very worthy cause. I have friends whose children have ended their lives, and I have informed them of what you are doing etc. When things get tough, just think of what I am workong on, for you and Patrick.